Some music sticks with you for a life time. It’s the music that you were raised on and grew up into and now shapes how you raise your own children. 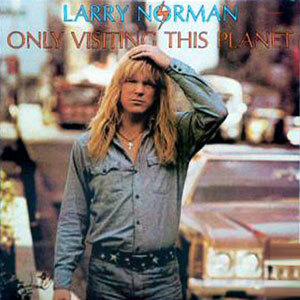 For some people that would be the Beatles, Elvis, or the Doors, but for me it is Larry Norman. Later in my childhood, music didn’t seem to be played as often in my home. I’m not sure why that was. When I was a tween I started listening to music on my own. I’d buy an album once every 4 months or so with my allowance. Not having a lot of money to find new music to listen to, I also started mining my Dad’s record collection to help feed my desire to hear more music. I remember going through each of my dad’s records and listening for a couple seconds and thinking “crap.” I tried the next record “crap,” “Crap,” “more Crap,” and then I found it. I found a record with a long haired man looking very cool and intense. I popped on the record and fell in love. The album was “Only Visiting This Planet,” and every song was the most amazing arrangement of classic rock awesomeness I had ever heard. Songs like “The Outlaw” enshrined a picture of Jesus that holds true for me today in my spiritual life more then any theological book or preacher’s sermon. I’ve seen Larry Norman live 3 times. The first show was in High School with my friend Andrew, my brother Regan and my Dad. We arrived 3 hours early and were the very first people in line. It was general admission so we wanted to make sure we got good seats. No one else showed up until 2 hours before the show (and they were very surprised that they weren’t the first people in line). The Funny thing was that after all that waiting we had to settle for 2nd row seats because the promoter let his family in early and they took up the front row. Luckily they were short and we still had a great view. I had enough money at this show to buy a couple tapes that I didn’t have, but there were so many more recordings that I didn’t own but didn’t have the cash to purchase. The second show I saw was in University and I had saved up $200 from teaching guitar lessons. I bought every album I didn’t have, and upgraded a couple I did have to CD. I even bought a couple”best of albums” that had alternate versions and bonus tracks on them. The third show I saw was with my wife Susan shortly after we were married. I again bought a lot of merch (including the this week’s Larry Norman for President T-Shirt) and Susan got to see her first glimpse of my weakness for merch. These Larry Norman shows weren’t just about the music, they were religious experiences for me. It sounds cultish but it was like getting to hear a prophet or great philosopher. I hung on every word of every story between every song. I laughed at his jokes about dinosaurs and almost cried as he told people “If you don’t help feed the poor, don’t buy my records, and don’t come to my shows.” Again it sounds sacrilegious to write about how much I look up to Larry Norman as an idol, but his music and persona has been such a huge part of my life. In 2008 Larry Norman passed away and I mourned as if I had lost a close family member (even though I never met the man in person). Believe it or not Larry Norman even showed up in a couple of my dreams at that time, and as cheesy as it sounds i sort of feel like I got a chance to say goodbye. Here is a 2x the Mono track called “Cowboy Pacifist” that comes straight from my Socially Conscious Larry Norman Roots.